Nathaniel Hawthorne wrote The Scarlet Letter in 1850. Similarly, I’ve seen people argue that The Green Glass Sea by Ellen Klages isn’t really science fiction because it’s a historical novel set in 1943 telling a coming-of-age story of an 11-year-old girl growing up in Los Alamos where her father works on the secret project to build an atomic bomb. Whereas I think the nerdiness of a girl in the 1940s who is building her own radio from parts salvaged at the junk yard, combined with the way the novel explores how the government’s pursuit of this new technological advantage uproots children and disrupts their lives (exploring how new technologies impact society and people in nonmaterial ways has long been a significant part of sf), more than qualifies it. 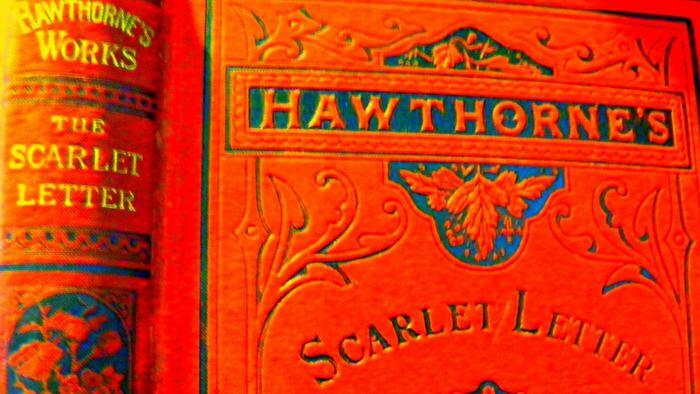 But the granddaddy of all sf/f novels that people don’t realize is science fiction has got to be Nathaniel Hawthorne’s The Scarlet Letter. I can hear you protesting, “But the Scarlet Letter is a Gothic morality tale about Puritan scandal and consequences and forgiveness set in the Massachusetts Bay Colony that they made us read in school. It can’t possibly be science fiction!” That just means you aren’t looking at it from the perspective on 1850, when it was written. Your argument that it isn’t sci fi is similar to someone saying, “Twenty-Thousand Leagues Under the Sea isn’t sci fi because supermarines are real!” Submarines didn’t exist when Verne wrote his story of Captain Nemo and his fantastic undersea ship powered by a mysterious electric force. Similarly, in the Scarlet Letter the character of Chillingsworth (who is secretly the long lost husband of poor Hester Prynne who is saddled with the shame of having had a baby born too long after the presumed death of her husband to be legitimate) is a great example of a science fictional mad scientist. His methods of subtle torture as he secretly experiments on Reverent Dimmesdale (while pretending to be trying to cure his illness) was very science fictional. There are no herbs known that will “corrupt the soul” as the text colorfully describes it. Certainly nothing that would force a man’s greatest fears and secrets to manifest as physical scars that spell out his greatest sins on his flesh! When described that way, people think of Chillingsworth’s “dark medicine” as some kind of magic, like B-movie depictions of voodoo or the like (complete with colonial cultural misappropriation, but I’ll get to that). But when Hawthorne wrote it, he meant it as what we would today call science fiction. He and many other educated people at the time believed that the sorts of effects he described could be accomplished by the proper application of chemistry and biology, we just didn’t know how, yet! Just as many scholars refer to Mary Shelley as the either the mother or grandmother of science fiction (never forget: the author of Frankenstein was a teen-age girl who wrote a story which invented sci fi on a dare in 1818), they also sometimes refer to Hawthorne as the grandfather of sci fi. Hawthorne’s more obviously sci fi type stories, such as “Rappacinni’s Daughter,” “The Artist of the Beautiful,” or “Dr Heidegger’s Experiment” usually featured a mad scientist type character, rushing in to the dark corners of the universe where angels and sensible people hesitate to tread. But his more famous bits of gothic tragedy also have these elements. The House of Seven Gables has a hypnotist and posits a notion of inherited sin—that committing particularly heinous acts will warp you in ways that will somehow be passed on to your children. If science had known of the mechanism of DNA at the time when Hawthorne wrote, he surely would have had some learnéd person in the narrative talk about the theory of corrupted chromosomes, for instance. Which brings us back to The Scarlet Letter, and the medical experiments that Chillingsworth secretly subjects Dimmesdale to as part of a plan to exact revenge on the man. The Scarlet Letter was unusual in Hawthorne’s time for feature a female protagonist. And even more, for portraying the fallen woman as a sympathetic character, more worthy of the reader’s love and respect than any of those who stand judgment over her (and her child). Especially more worthy that her long missing husband, who instead of proclaiming his identity upon returning, forgiving his wife Hester for doing what she had to do to survive while he was off studying herbs and potions with vaguely described Native Americans, and raising Pearl as his own child, embarked on a truly mad plan to exact revenge on the father of Hester’s child. I saw movie adaptations of The Scarlet Letter before I read the book. A copy of the book was part of a set of classics that a relative had given me for a Christmas present, but I didn’t try to read it until after watching one of the movies on TV. When I did, I found a lot of the contents had been glossed over in the movie. The movie made Chillingsworth’s actions seem more like just some slow acting poison, whereas the book made it clear Chillingsworth was doing something far more subtle and medically revolutionary. Meanwhile, Hester refused to give in to the public shaming, but to sew her own scarlet letter A on her clothing and support herself by sewing. She also tends to the sick and destitute in the community, so much so that many begin to say that the A she wears doesn’t stand for Adulterer, but Angel and Able. That was a revolutionary idea: that a woman could take her destiny in her own hands and assert her independence. It was radical in 1850 when Hawthorne wrote it, and it would have been even more revolutionary in the mid-seventeenth century when the action of the novel is set. The Scarlet Letter painted a portrait of how someone shunned and ostracized by their community–even someone condemned by the religious leaders–could be a noble and good person, contributing to society and ultimately rising above the false morality of that community. That was an important lesson for this queer kid growing up among Baptists and rednecks. I've loved reading for as long as I can remember. I write fantasy, science fiction, mystery, and nonfiction. I used to publish an anthropomorphic sci-fi/space opera literary fanzine. I attend and work on the staff for several anthropormorphics, anime, and science fiction conventions. I live near Seattle with my wonderful husband, still completely amazed that he puts up with me at all. May your chocolate bunnies never run out! The Librarian Who Doesn't Say Shh!